Sometimes debt will just creep up, even for the best of us who think we have it all under control. But how can we easily manage our debt? Is there an easy way to manage debt? Of course there is! 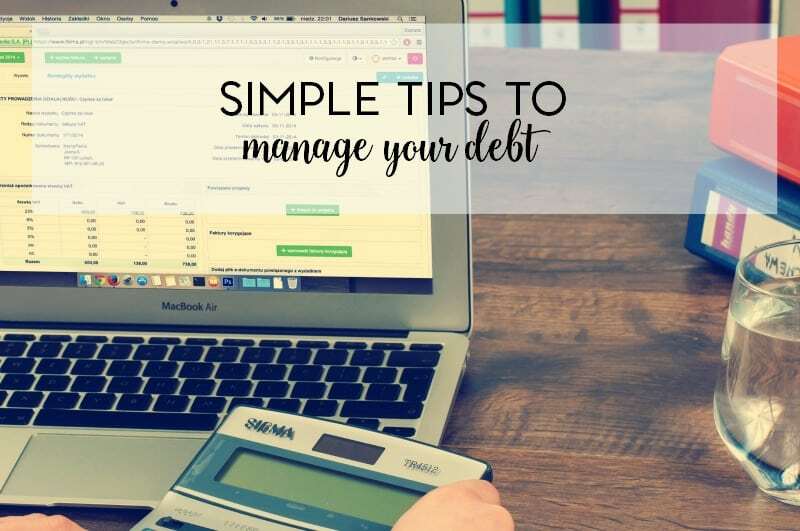 And today, we’re going to talk about six simple debt management tips– some of which you might already be doing. Even when debt does start to creep up on us, it might not be intentional and that’s completely understandable! So long as you take control of the situation, so it doesn’t take control over you or your life- you’re going to be okay. Managing your debt doesn’t have to be difficult. And once you have it under control, it will be easier to get out of debt and stay out of debt. * Stay away from credit cards with annual fees. There are plenty of them available that do not charge these fees, and you can usually get them even if you have little or no credit history. When you’re first starting to build up your credit, you might have to settle for a credit card with an interest rate that’s not so good. But as soon as you build up a good payment history of six months or so, start looking for a card with a better rate. When you find one, stop using that high-interest card (but don’t close the account, because having available credit is good for your credit score). * Pay your balance in full each and every month. If an emergency comes up and you can’t pay the entire balance, make certain that you pay it off within two or three months at the most. This will save you money in interest and keep you from running up a high balance. * Build up some savings so that you don’t have to rely on credit. Having an emergency fund that equals at least three months’ income is the best way to keep yourself afloat in the event of job loss or some other sort of financial disaster. Depending on credit to get you through such situations sets you up for more trouble down the road. * Instead of charging the things you want, save up the money to buy them. Most of our wants can wait until we are able to pay cash for them. And the habit of charging non-necessities (unless you pay the balance in full right away) can be a very dangerous one. * If you find that you’re not going to be able to make a payment, talk to the creditor immediately. Some will allow you to skip a payment with no penalty if you’re experiencing a temporary setback. Just don’t make this a habit, because interest will continue to accumulate even though no payment is required. * Bonus tip: create a get out debt budget so you can easily put all of your finances in place. Of course, these are only six tips but this should be a good start. What other ways can you think of to help manage your debt?